Questions and answers | CrowdFarming - The website does not recognize my account even though I registered with my name and email address! All Categories ​>​ User Account ​>​ The website does not recognize my account even though I registered with my name and email address! The website does not recognize my account even though I registered with my name and email address! It seems like you have only signed up for our FARMER NEWS. 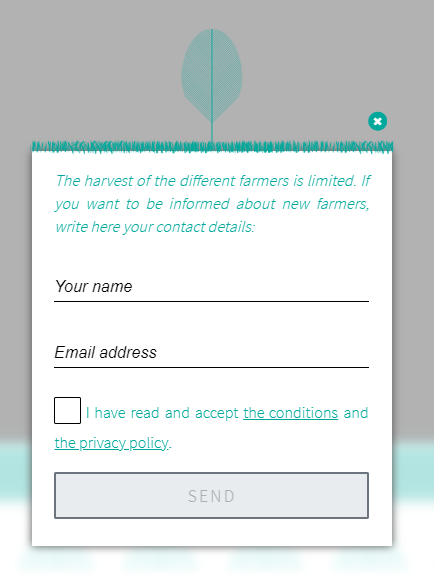 When you visit our website, a pop-up window appears after a while asking you to fill in your name and email address to receive the latest news about CrowdFarming. However, this does not automatically register a user account for you. You will find more information on how to create a user account in the corresponding article. If you previously registered an account with Naranjas del Carmen, please bear in mind that these two platforms are NOT connected to each other. The login data from your account at Naranjas del Carmen will not work on the CrowdFarming website. You need to have a separate user account for each platform. How do I access my user account?